A collision occurred between a blue Peugeot 206 and a parked red Seat Ibiza car about 11am on Monday October 22 on Manse Brae, Lochgilphead. Subsequently, an 85-year-old woman was charged with careless driving and failing to stop and report the collision. Nobody was injured as a result of the collision and a report will be submitted to the procurator fiscal. About 7am on Thursday October 25, a car crashed on the A83 in Ardrishaig. The driver, a 24-year-old man, was not injured and was charged with careless driving. He was issued with a £100 fixed penalty ticket with three penalty points. On St Clair Road, Ardrishaig, about 5am on Saturday October 27, a 38-year-old man allegedly behaved in an abusive manner. Police arrested the man who struggled with police and resisted arrest. 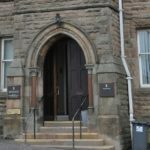 The man was taken to Lochgilphead Hospital where he was abusive to hospital staff and assaulted two police officers. The man was charged and a report will be submitted to the procurator fiscal. A man aged 28 was stopped and searched by police and allegedly found in possession of a small amount of cannabis about 10pm on Saturday October 27, in West Bank Road, Ardrishaig. The man was charged and a report will be submitted to the procurator fiscal. On Sunday October 28 at about 11pm, on the A83 at Lochgair, a woman aged 49 was arrested for driving while under the influence of alcohol. Subsequently a blood sample was taken for analysis. If any member of the public has information in relation to the above, or to any incident, they can contact their local police office on telephone number 101, or anonymously through Crimestoppers on 0800 555 111.